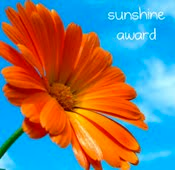 I am both flattered and honored to have been nominated for a Sunshine Award by Beth Teliho in her amazing blog, Writer B is Me. If you haven’t had a chance to catch her blogs, mosey on over; you are in for a treat. Now, for my lengthy acceptance speech, wherein no one is allowed to start playing cheesy music as my lame cue to vacate the stage. I’m here, I have a spotlight and a microphone, and for crying out loud, I intend to abuse the privilege! There are some loose rules and guidelines for my acceptance, which in typical me fashion, I intend to disregard completely. Like, I’m supposed to tell you guys 7 interesting things about myself. Sadly, I can’t think of anything interesting about myself that I haven’t already blogged about ad nauseum. Yes, perhaps you missed the interesting posts, but they were in there. The only thing left for me to do is to direct you to my Blogroll, which lists my favorite bloggers. It’s right over there in the sidebar, underneath my Twitter feed. I faithfully read all of their blogs and plagiarize draw inspiration for my own writing. Check them out! This entry was posted in Uncategorized and tagged Blogging, Culture, Friendship, Social Media, Writing. Bookmark the permalink. 16 Responses to Good Day, Sunshine! Hey Jill! Congrats on the Sunshine Award as it’s well deserved. Thanks for also including me in your blogroll! Thanks! I always enjoy your blog and it reminds me how much I loved living in NYC during my brief stint there. Congratulations! Very well deserved. I’m flattered to see my blog in your roll. Many thanks! Thanks Pam-I always get a giggle when I come over to your blog. I mean, it’s supposed to be funny, right? Oh my. Ahh, the woman who started my blogging “career” and now can watch its METEORIC rise. Phenom. I had nothing to do with it – just was and continue to be your biggest fan of an ever-widening club. Oh and btw, mazal tov! Yeah i wanted to hear more about you too… like how about that fabulous sister-in-law you have. Good grief-a chapter plus plus in my book wasn’t enough for you?